That, in a nutshell, is one of the first things I heard after the word “welcome”. Recently, Linda and I took our Hydeout to Denver for a 3-day conference she was invited to attend. After checking into Woolley’s Classic Suites and taking advantage of their complementary happy hour, she and I got a text from her mentor to join them in the hospitality room set up for the Travel Agents Alliance Group, or TAAG. When Linda started helping her mentor, Theresa Masterson, several years ago, it was to do research and to assist with wedding shows on a part time basis. Destination weddings and honeymoons are a large niche of the travel industry, and can be a lot of work. 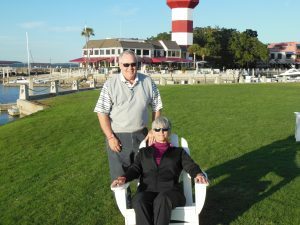 Their business was, at the time, affiliated with an umbrella company that had many franchises that could pool together and get better deals on travel packages for their clientele. When that company dissolved, there was still a need for support for the individual agents and companies that were left somewhat adrift. Hence, TAAG was established by co-founders Janet Ash and Elly Sterlacci, to replicate the benefits of the previous umbrella company without the negative ties some would remember. During our welcome introductions a gentleman asked if I was going to participate in the meetings. Unsure of my agenda, my answer was going to be pretty much noncommittal. Before I could express my doubts, however, I was invited to join him and others to hang out, away from the busy workshop schedule. I already knew that I would be welcome to attend the meetings along with my spouse, but I didn’t know if my attendance would be a bonus or a burden. And here I was offered an alternative. 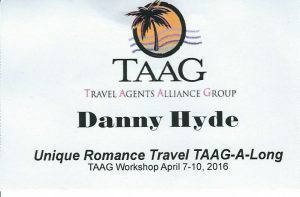 It was also pointed out, quite literally, that my badge had me labeled as a TAAG-along. Well, okay! In one respect I was already in unofficial tag-along mode since this whole trip was for Linda‘s business needs. But, now there was another agenda, quite flexible, and very laid back, to consider. I’m in! I actually attended the morning session for about an hour and two short presentations from vendors representing resort groups. It was very informative, but my presence was redundant. Linda could handle this quite well without me in the way. The plan now was to meet the TAAG-alongs at noon. Our first stop was Firehouse Station #26. That was both the name and location of a local craft brewery. Outdoor seating fit our needs, and the weather cooperated nicely. Some of the more “experienced” spouses spoke of the perks and dividends that might be earned by the agents through various vendors when waging a successful seasonal campaign. Discussion was good; so was the beer. Next up was Lowry Beer Garden, located adjacent to the old Lowry Air Force Base. This craft brewery had indoor and outdoor seating, as well. Some more mellow conversation was accompanied by a more mellow brew, for me, at least. A nice apricot and wheat beer was a nice way to end our outing. The evening agenda started with an adventure in TAAG-team-building. 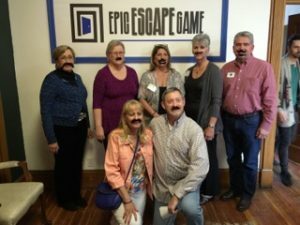 The entire group of agents and spouses went to Epic Escape Games. Divided into 6 groups of 6 or 7 members each, we were led to our assigned room, locked in and invited to solve games and puzzles to unlock the mystery and the exit door. We had a 60 minute time limit for the task. It definitely took teamwork and different modes of thinking and working together to figure out the “keys” necessary to escape. Our group was successful in getting out with about 6 minutes to spare. As the proof is in the pictures, you can see it was a tough task! Whether a group actually escaped or not, it was still a good exercise to “people watch”, before and after (there definitely wasn’t time during the escape!). I must admit I’m often guilty of that; it’s probably part of being a bit of an introvert. It was both entertaining and educational to see who favored results and who was more focused on the process. Maybe I’m slightly nerdy that way, but it was interesting to experience. There are many adjectives one could use to describe TAAG. The word inclusive would have to be near the top of the list. The fact that all of the activities were open for attendance by agents and spouses alike was proof of that. Tonight’s entertainment exercise was the Escape Game; the next evening would be a wine tasting we would all attend. Both events were followed by dinners sponsored by various vendors. Let me say that the vendors were excellent hosts who appreciated the business ties they were cementing, because the food was outstanding and each dinner venue was unique. It’s not often I’m offered roast bison for a meal choice. And, yes, it was delicious! Saturday’s outing with the TAAG-alongs was at a local golf course, Buffalo Run, which suited me perfectly, even though I didn’t come totally prepared. I joined Ron M., Glen Couch and Sean Ash, Janet’s husband and a pilot, in a game of Robins (short for round-robin partners match) for nine holes of fun. My only regret was my usual: I didn’t have my own clubs this time, either. Thank you TAAG-alongs for sharing! To recap, this long weekend was a fun, productive adventure with fun and productive people. We are excited to have met this group of dedicated travel entrepreneurs. We learned about TAAG. We got excited again about the many ways and places we could travel and help others do the same. And we look forward to hearing about your travels and wish list, too! 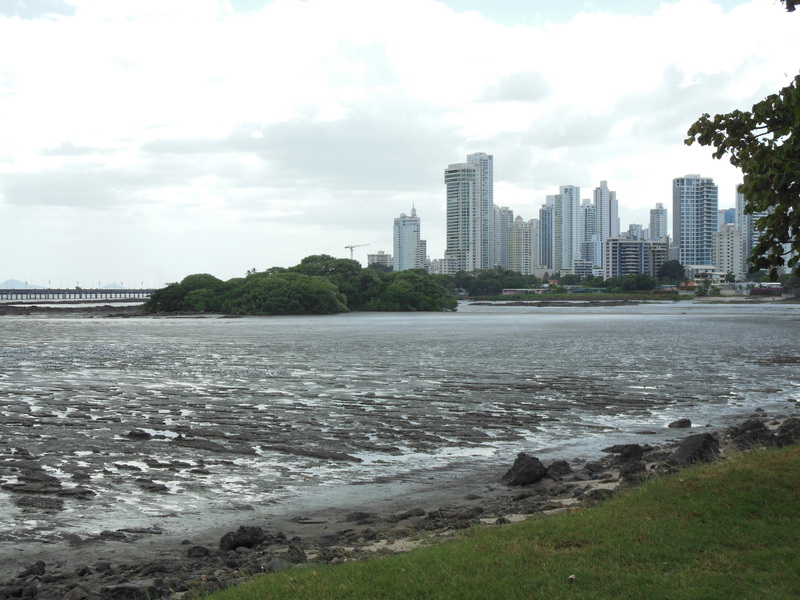 By the time January of 2015 rolled around, we decided to finally make a long-awaited visit to Panama to scope out the area for a variety of reasons: writing several articles for different types of publications, including this blog; possible relocation for home and/or business, or at least, a 6-month reprieve from Midwest weather; and to check out some new golf courses. We were hoping to visit for at least a week on this initial venture; we could only manage to schedule our stay for 8 days. 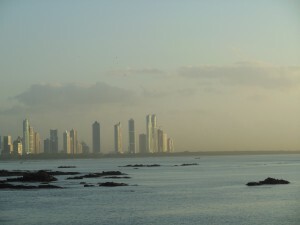 Panama City is a large bustling metropolis with all the amenities of a big city. Fine dining, theaters, museums, hotels, and visitor centers are spread among the buildings that house one of Panama’s biggest industries: banking. With all the goods and services that make their way through the Canal each and every day, money and banking is both a lucrative and necessary part of their economy. There is something here for everyone if you have the time and inclination to look. They also have every bit of the traffic one would expect in a city this size. The decision to drive a rental car instead of depending on public transportation was one we questioned from the very first night. I quickly learned that my somewhat lacking skills in Spanish were compounded by a navigator that knew even less than I (I studied Latin and Spanish in high school; she studied French). But, if there’s one thing we have learned over the years, it’s this: vacation is not vacation without at least one U-turn. Upon leaving the airport, with fairly detailed verbal instructions from the very helpful car rental agent, we proceeded to make our first (of many) U-turns, or as they refer to them on signs by the roadway, “retorno”. The second U-turn, unfortunately observed by Policia Nationale, was another of the many adventures we would look forward to. Let me just say that we were not ticketed, as we could have been, and I remain grateful to the Policia Nationale for their prudence when dealing with gringos, even when language barriers exist (especially if they want us to return as expats). We finally found our way to the Hotel Riu, a very nice venue in the heart of the city, and our temporary abode. 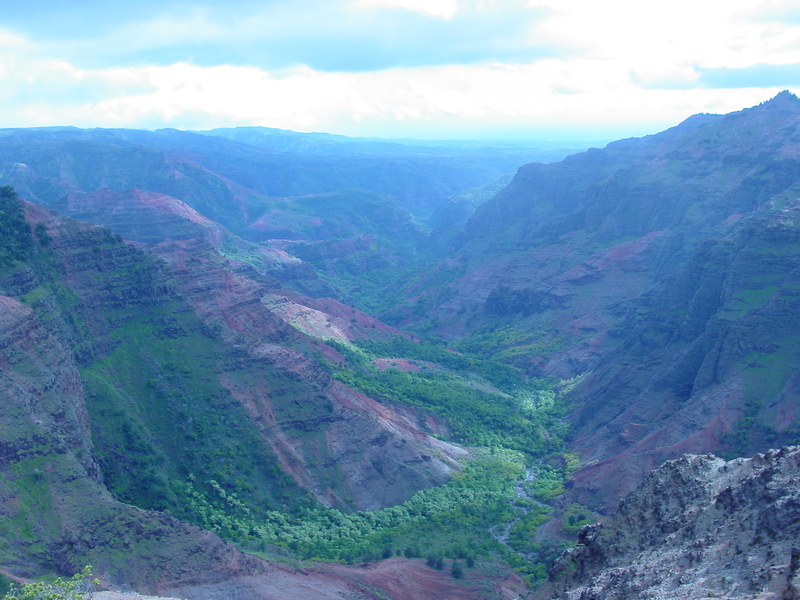 Once we became somewhat acclimated to our location, we realized how very convenient it was to many of the things we had planned. Didn’t we do well? (Here’s where I try not to hurt my arm… patting myself on the back). 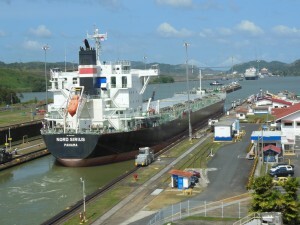 Our first sight-seeing and research trip was, of course, to the Panama Canal. What U.S. citizen wouldn’t want to see that? Because we are baby boomers, we studied that in social studies and history courses enough that it was a no-brainer to get that out of the way early. It was definitely a worthwhile venture. We didn’t get any pictures, unfortunately, of the construction of the new wider canal adjacent to these locks. This feature will assist Panama and the users of this seaway tremendously. The traffic going both ways was severely backed up with ships waiting to go through. And, with the wider locks being constructed, the larger super-size tankers and cruise ships will be able to utilize the canal for the first time. 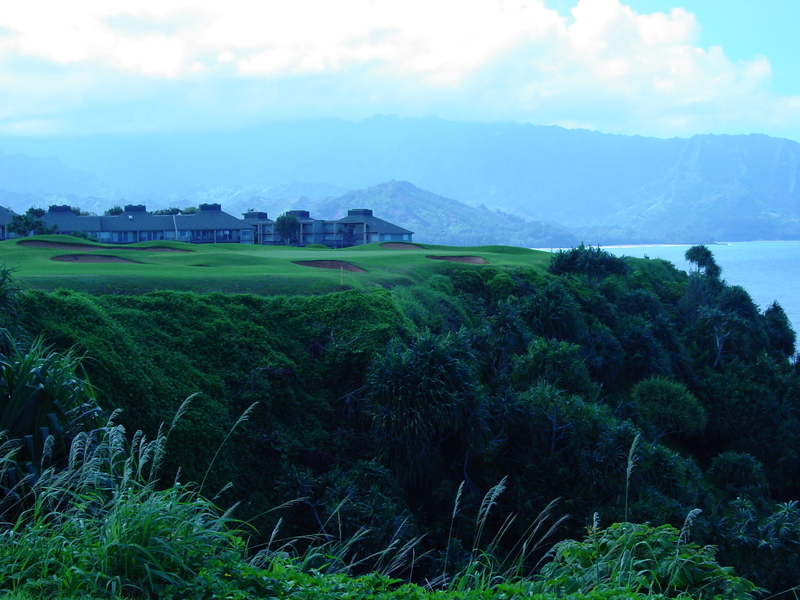 When we left home I made a conscious decision to not take my golf clubs because this trip was supposed to be for exploration and research rather than purely enjoyment. Silly me! She, of course, took hers because, being practical, you’re allowed 2 checked bags on most International flights, and she has a hard time with rental clubs not fitting her properly. My decision cost me dearly because I though we might play once while we were there. No! It was more than once, and of course, I paid for rental clubs each and every time we did research at a golf course. Needless to say, I regretted my decision to leave my clubs at home every time she reminded me (which was fairly often, and fairly well deserved)! After our visit to the locks at Miraflores, Summit Golf Club was our first golf stop. 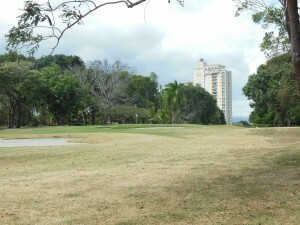 It’s a very old course, built in the 1930’s, for Americans who lived and worked at the Canal Zone during that time. 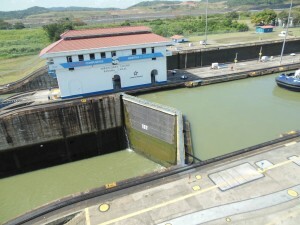 It’s situated about half way between the locks at Miraflores and those at Pedro Miguel. 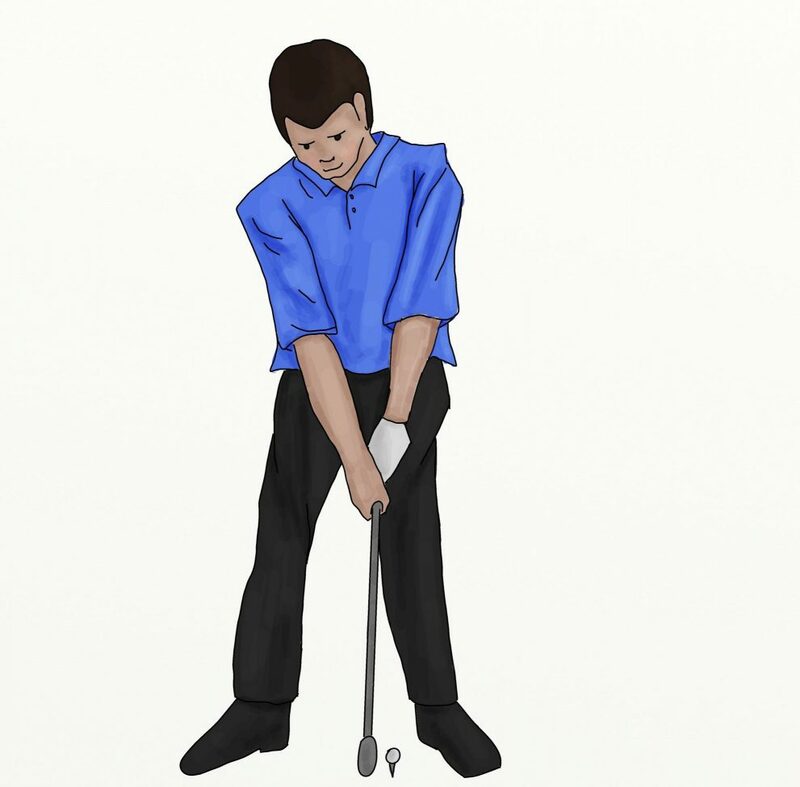 Green fees were $90 USD (United States Dollars). I always think golf is overpriced in Mexico and Central America. Usually, I believe courses would receive much more play and make just as much money if prices were lowered somewhat. But, they didn’t ask me. Oh, well … at least it’s consistent. Tree lined and somewhat hilly, the course was a fairly traditional design, but not overly memorable. There weren’t many blind shots, always a good thing. Most of the trouble, such as bunkers and water, were fairly visible, which is always comforting even when the shot required may not be. Since there aren’t as quite as many Americans there now because Panama now completely controls the canal, and has since December 31, 1999, and obviously employs native Panamanians, this course sees much less play than it once did. I thought it pretty obvious when I looked at their web site and noticed that nobody had updated it since 2010. The course, however, was maintained pretty well, but, not in primo condition according to our (or my) standards for American courses. We both played a rather mediocre round; of course, my excuse is rental clubs. What else would you expect? Our next adventure was to explore the area around Coronado, about an hour’s drive from Panama City, “up” the coast, or west, if you pay attention to things like maps. This is the area that locals refer to as the “dry arc”, where there is actually less rainfall than other areas of this country, and plenty of nice beaches to draw people in. Plenty of ex-pats call this area home for this simple reason. We’d heard nice things about Coronado and wanted to check it out as a possible landing spot, and because we knew there were enough golf courses in the vicinity to appeal to our curiosity. So, we did! And we all know that driving around, gawking, and trying to not get lost is thirsty work. We found ourselves near the beach in the little village near Playa Farallon. Finding an establishment named “Woody’s” let us know we were in the right spot. Upon entering, the first thing I noticed were about 6 televisions playing, and 5 of them had on a hockey game. Of course, we found out that Woody was from Canada, and this had been his place. Woody had passed on, but his legacy, in the form of this bar and grill, is still a place to find ex-pats and other friendly people, many of them Canadians like Rob B. and his wife, who enlightened us with tales of living in Panama as an ex-pat and sharing the local history. Actually, Rob chatted while his wife painted decorative lettering on the walls as a favor to the owners. They did let us know of a “meet & greet” happening the next day at a local restaurant called Picasso’s, where many gathered once a week to chat informally with others who had moved here from afar. Even though it would mean another hour’s drive back and forth from Panama City, we figured it would be worth it. Certainly we could squeeze in a round of golf before going to Picasso Community Happy Hour, too. 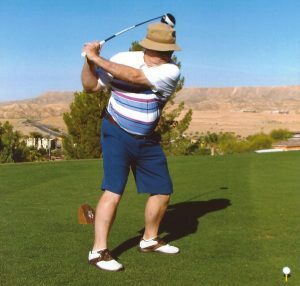 That took place at the Coronado Golf and Beach club in Playa Coronado just a few kilometers away. This Tom Fazio designed course was definitely to my liking. I’m a fan of his layouts! This one did not disappoint. It was long, but fair, for men and women alike, and thoroughly enjoyable. Being here in January, I didn’t think twice about the somewhat brown look of the grass. At home most warm weather grass was dormant, so it looked natural to me. During our round the club pro drove out to chat with us, which I found surprising anyway, but they were not overly busy. 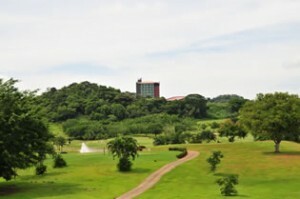 He apologized for the condition of the course because it was the dry season; everything was not as green as it would be in a few more months! Heck, it was January; it was about 85 degrees; I was wearing shorts; I was playing golf on a really good course. Please, you have no need to apologize! The short drive to Picasso’s allowed us to get a great parking spot and a table before the crowd arrived. And it did become a crowd. Many people were here to meet with friends; it was definitely a social event for most. Some were here to work, we found. Linda and I looked at each other with raised eyebrows when one gentleman let us know he was available if we wanted to look at real estate while were here. Yeah, and I’ve got a bridge in Arizona I’d like to sell cheap, too. After he left us alone, a kind man came over and asked if we could chat. He warned us of our previous visitor. We thanked him for letting us know that not everyone who was here came for the food, the ambiance and good company. Niceties concluded, we enjoyed a fun evening of music and good conversation. After 4 days in Panama, and several trips driving, sightseeing, golfing, fine dining and generally being on the go, we decided to take a little break for pure relaxation and a little research. Every trip needs one of those, and we call it a Hydeout. 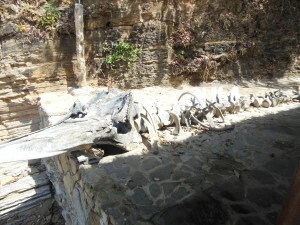 We wanted to visit one or more of the Pearl Islands (Isla de Las Perlas). So, we did! We took a water taxi in the form of Ferry Las Perlas, which, at the time, cost $95 each USD, round trip for the approximately one hour fifteen minute ride each way to Isla Saboga. If $95 sounds a bit high, let me explain; also included are use of equipment on the island such as kayaks, snorkel gear, the lounge facilities, chairs, hammocks, and best of all, lunch and drinks, to include beer and wine. Spirits and mixed drinks would be extra, of course, if desired, but, hey… not bad. And, most of all, it was exactly the type of relaxation we were looking for. The ferry must have been on “island time” or we were just anxious to get started. When we did leave we enjoyed a pleasant ride to our destination. 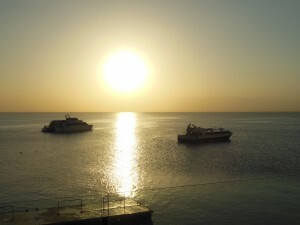 The large ferry passed us off to a smaller shuttle to get us to shore because there was no dock or landing. We really were beaching the craft to climb out and wade ashore. Good thing we were forewarned and dressed for the beach; this just made it seem more rustic. We were glad we were looking for natural and quiet rather than looking for a five-star experience. Returning to Panama City served as a reminder, to me, at least, that travel in other countries should make one aware at all times. Not all public transportation rates are published or depend on meters. Our taxi ride to the ferry point in the morning was a very reasonable $3 fare from our hotel. Failing to ask or negotiate with the cab driver returning us to our hotel was my mistake. This driver wanted $7 for the same trip. The morning driver received a very nice tip. That’s all I’ll say about that. When in Panama City, it’s almost a requirement to visit Casco Viejo. 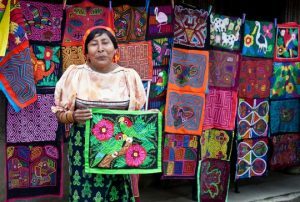 This quaint old town area is as colorful as the native dress. 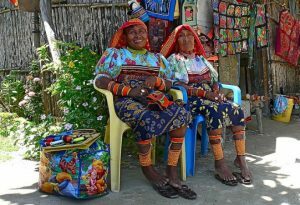 There are quite a few street vendors who wear their vividly colored attire. Historic to its core, it is home now to many hotels and restaurants that cater to tourists and locals alike. One eatery that stands out to us is a tapas bar called Tantalo’s located in the Tantalo Hotel. Everything on the menu looked and sounded great. Additionally, our waiter gave us great advice. We enjoyed three different dishes over the course of the evening, finishing with an after dinner beverage at the roof-top bar. Linda tried the house specialty, the Zen-Jito, and voted it a sure winner. Since we ate at our normal dinner time, we were still ahead of most of the night life and the crowd. As we were leaving, the roof-top bar was filling up nicely; they were set to party with views of the city skyline at their fingertips. Next time we are in Panama we will make it a point to visit Tantalo’s again, without a doubt. One more trip to the area near Playa Farallon on our last full day there took us to Mantaraya Golf Course. As a semi-private venue, it also welcomes membership to the club for a fairly reasonable annual fee. The many condos and the nearby hotel pretty much guarantee a number of players available for continued viability. The course was a fairly open layout with few trees, but plenty of bunkers to keep things exciting. It was a fitting end to our time in Panama. Since we didn’t get to do all we had hoped, there will be a return trip. Next time perhaps we will fly to David and visit the western portions and mountain areas as well as the beaches near there. We are definitely looking forward to our next visit!